Xbox players can get the July update now as it began to roll out to all users yesterday. The update brings several new features incident improvements for Mixer and lots more. One of the big updates is the addition of FastStart tech for some games. That feature allows players to get to playing games they are downloading twice as fast. FastStart identifies the files needed to begin playing the game and downloads those files first. This allows players to get into full-fidelity gameplay while the rest of the game downloads in the background. 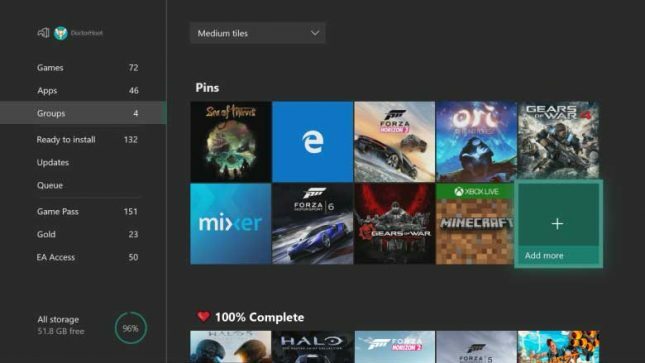 FastStart enabled games are marked in the catalog and some games in the Xbox Game Pass catalog are enabled with the tech now with more titles coming later. Gamers can now group their games with an enhanced version of Pins called “Groups.” Groups will be available in My Games & Apps, Home, and Guide. Groups are tied to the Xbox Live account, not the console so they will be available and sync across all consoles owned. Search options have expanded and pressing the “Y” button anywhere in the dashboard will bring up a search dialog. Full keyboard and mouse support are enabled in Mixer along with multi-touch support for touch-enabled devices and multiple controls can be used at one time. Mixer streamers can go full screen with the webcam while broadcasting.